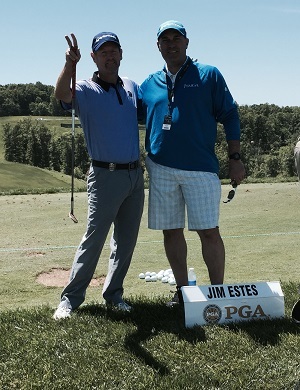 Co-founders Jim Estes and Jamie Winslow at the 2015 Senior PGA. Jamie, a childhood friend of Jim’s caddied for him during the tournament. Amongst all of these accomplishments, Jim conducted over 100 hours of golf lessons for wounded veterans and their families at our local golf clinics held at the Olney Golf Park. Congratulations on a great 2015 season Jim!